History in Place, a new project aiming to strengthen ties between school students and their local community history, was launched on Tuesday at Federation Square, Melbourne. 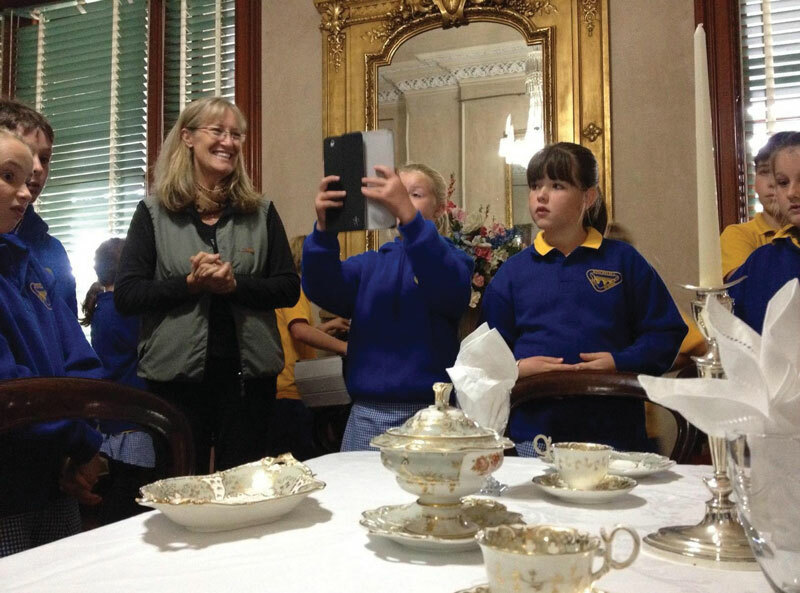 The program engages schools with their local museums, enabling students to create films on tablet devices about the history of their local area. The resulting films made by some North Melbourne Primary School students involved in the project pilot were displayed on the Federation Square Big Screen at Tuesday’s launch. History in Place, funded through the Telematics Trust and Arts Victoria, is the result of collaboration between the Heritage Council of Victoria, the History Teachers’ Association of Victoria, and Arts Victoria. Jim Norris, Deputy Chair of the Heritage Council of Victoria, said the program would give school students a sound understanding of the historic fabric of Victoria. “History in Place creates relationships between schools and community museums, allowing museums to reach younger audiences and forge new relationships,” Mr Norris said. History in Place in action: Trudi Toyne, manager of Barwon Park, shows school students around the heritage property. Courtesy of Culture Victoria. Jo Clyne, Coordinator, Education and Consultancy Services at History Teachers’ Association of Victoria, said History in Place helps schools deliver the new Australian history curriculum for years 5 and 6 in an exciting and engaging way. “History in Place is a great opportunity to challenge the minds of school students by allowing them to piece together Victoria’s rich and diverse narrative. It provides meaningful opportunities for them to engage with their local history and appreciate the stories of their local communities,” Ms Clyne said. In order to help other schools around Victoria engage with History in Place, the Project Toolkit has also been launched. Containing how-to videos and examples of some of the short films made by students involved in the pilot, this Toolkit contains everything schools and museums need to successfully run History in Place. Both the Project Toolkit and the students’ films from the pilot project are available at online – click here. The other films created as a result of the pilot project will be aired on the Federation Square big screen as part of a month-long program. Visit http://www.fedsquare.com/events/fedtv/ for full program details. Source: Heritage Press Council of Victoria press release, 10 September 2013.